After our trip to Oaxaca, I fell in love with the delicate flavor of fried squash blossoms. I bought some lovely cotija cheese from the market. 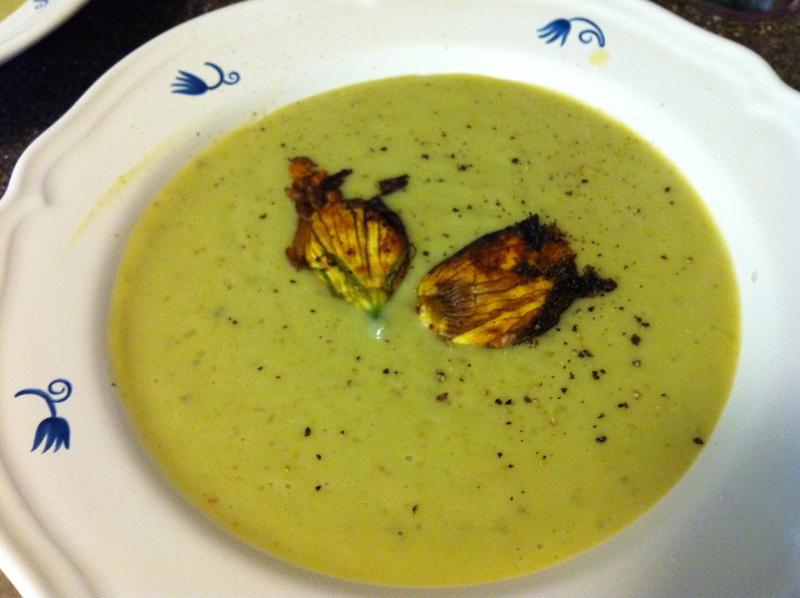 I wanted to make a creamy zucchini soup without adding too much “cream” or fat, you can omit the milk, just add a little water or let it thicken up with the squash puree alone. This is a two part recipe or you can just serve one alone. Heat a large stock pot or pan with the olive oil on medium-high heat. Add the onion and the garlic and cook for 2 minutes. Add the zucchini and squash to the pot, stir the flavors of the onion and garlic into the squash. Add your herbs and flavor and let cook for 3 minutes, stirring often. Add the water, cover your pot and bring to a boil. Reduce the heat if the boil is too high. I like to cook the zucchini and vegetables until really soft. It makes it easy to “cream” them later. This means I typically cook on medium heat for about 30 minutes. Add your milk (optional) about 5 minutes before you are done. Stir into soup and when done, turn off heat. Let soup cool for 10 minutes or so before transferring to a blender. I prefer this method, because it makes it a smooth creamy texture. Blend to a puree and return the soup mixture to the pot. While keeping my soup warm or trying to thicken it up, I taste the soup and add in my final spice ingredients. I think it’s important to try the soup before adding salt or pepper to see if it actually needs any at all. Sometimes I like it a little spicy and will add a little cayenne. If it’s too thin, you can add a little cornstarch to thicken it or cook it about 10 minutes longer. Take the squash blossoms and run under water to clean out the inside of the blossom. I like to remove any pollen or stem inside or outside the blossom. Stuff the small piece of cheese inside the blossom and pinch the ends of the blossom to hold it closed. You can also fold the end over. Heat the olive oil in a pan on medium heat and add your blossoms. Let cook for about 7 minutes on both sides. The cheese will close the blossom making a nice little pocket of cheese. Remove and place on to a paper towel to dry and drain any oil. 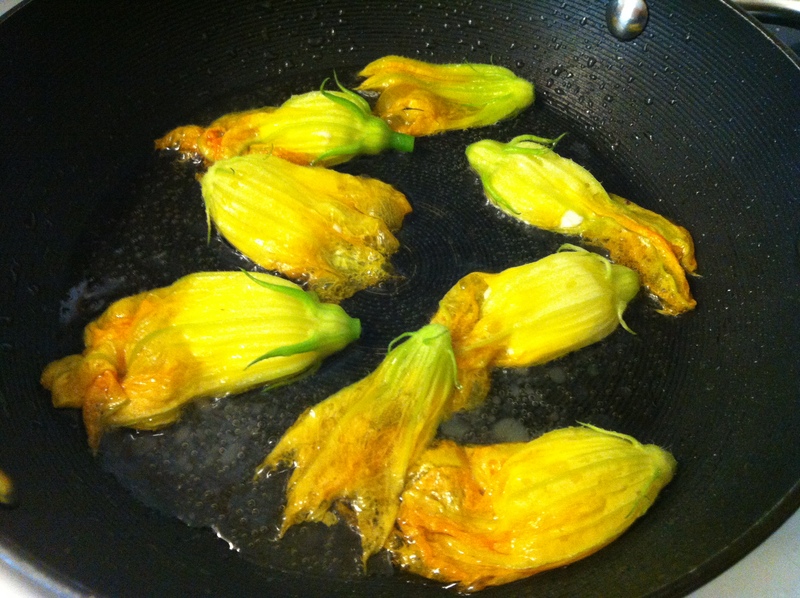 Place squash blossoms on top of soup or just enjoy with a little cracked salt and pepper. I’m diggig the healthy food options you are posting!